As cocaine deaths rise rapidly, it is important to adopt a comprehensive health and harm reduction approach that addresses addiction and overdose deaths in all communities. It’s time to retire the term “opioid crisis.” This never was just an opioid crisis – it’s an overdose crisis. Rates of opioid use and addiction have increased over the past decade, yet rates of opioid-involved overdose deaths have increased at a much, much higher rate. And while about 2/3rd of overdose deaths are classified as “opioid-involved”, the vast majority of these deaths also involve alcohol or other drugs. Opioids are clearly only one part of a much larger tragedy. A recent study published in JAMA Psychiatry, a BuzzFeed analysis of overdose death data, and other media coverage have shed light on a disturbing emerging trend—a rapid increase in overdose deaths involving cocaine. According to the Centers for Disease Control and Prevention, cocaine-involved overdose deaths rose a staggering 52% between 2015 and provisional counts for 2016. There are numerous possible explanations for why fentanyl is mixed with cocaine. Some think people who use drugs are deliberately mixing cocaine with fentanyl. Others think people who sell drugs are mixing fentanyl into their cocaine supply. And some others think that this may simply be a result of accidental cross-contamination, as suppliers often handle more than one type of drug. 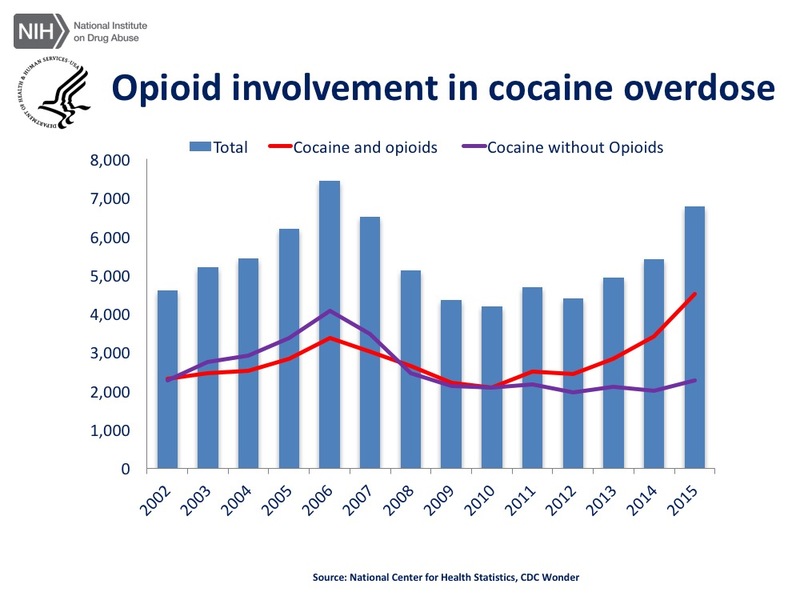 However, even without any adulteration by fentanyl and other opioids, there has been a notable increase in the number of cocaine-involved deaths – further proof that the current crisis isn’t only about opioids. Not only has there been an increase in cocaine-involved overdose deaths, but the death rate has been significantly higher for Black people, compared to any other racial group. A recent study looking at trends in overdose deaths found that the cocaine overdose death rate among Black people is comparable to the heroin overdose death rate among white people. The current crisis has been perceived and portrayed to be associated with white communities, buoying calls for a “gentler war on drugs.” When the face of addiction is Black, however, the response has been characterized by criminalization rather than compassion. Continuing such a racialized response will only worsen the overdose crisis, especially as we see changes in which communities are most affected. While the risk of drugs contaminated by fentanyl need to be addressed, the media hysteria around fentanyl has often led to inaccurate stories. Worse, it has led to a rash of draconian fentanyl sentencing laws. In just the past two years, more than 25 states have passed legislation to increase fentanyl-related penalties, including mandatory minimum sentences, and some have even proposed the death penalty for selling fentanyl. But as fentanyl makes its way into the supply of different drugs, harsher sentences will just mean more criminalization and more people in prison, without doing anything to prevent overdose deaths. Harsh criminal penalties, which have long characterized US drug policy, will only perpetuate the disastrous impact of the war on drugs and sow the seeds of future tragedies. The need has never been greater for comprehensive health-centered drug policies, grounded in the principles of harm reduction, that recognize the full humanity of all people. Suchitra Rajagopalan is the Research Coordinator at the Drug Policy Alliance.